Gor Mahia secretary general George Bwana says that the team will not play AFC Leopards in the Top Eight tournament after their archrivals failed to honour the clash last Sunday. Bwana told SuperSport.com that his team will reiterated that his team will not accept anything less than playing against Tusker in the Semi finals on Thursday. He maintained that they would follow the decision by KPL’s league governing council to award them the walkover and threatened to pull out of the tournament if asked to face Leopards. Gor are slated to clash with Tusker in the semifinals on Thursday at the Moi International Sports Complex. FKF Cup defending champions Gor Mahia will play Borabu Chiefs from Kisii in their first match of this year’s edition of the President’s Cup. This was revealed on Monday during the ongoing draw being held at the FKF Secretariat in Nairobi. 2010 champions and last year’s finalists Sofapaka will play 2010 KPL winners Ulinzi Stars in their first match while current KPL table leaders AFC Leopards has been drawn against former champions Mathare United. The draw is currently ongoing and we will bring you more pairings and dates for the matches as we receive them. The tournament is set to kick off early August and the winner will represent Kenya in next year’s CAF Confederations Cup. Gor Mahia advanced to the semi finals of the KPL top 8 tournament. This was after AFC Leopards came through on their threat to boycott the match. Kogalo officials had implored their fans to turn up for the match. And despite the uncertainty about whether the game would be played a sizable crowd turned up. AFC now face a fine of ksh 8 million. Gor Mahia will play Tusker in the semis on August 2. On Sunday Gor Mahia instead played a friendly against Talent academy. The Sunday 29 July Kenyan Premier League [KPL] Top Eight match between Gor Mahia and AFC Leopards will proceed as scheduled. This was a ruling made the KPL governing council, in a meeting held on Friday 27 July. -In the event that either club fails or refuses to honour the match, the match shall be awarded to the club present for the match, reads a letter addressed to Football Kenya Federation’s Secretary General Lodvick Aduda, and signed by James Musyoki, the KPL Chairman. -The forfeiting club shall be fully liable and responsible for paying in full any related penalties or losses of bonuses that may be applied against KPL broadcast and/or any rights holders and/or other sponsors and/or any other contractual obligations. AFC have over the past one week stuck to their bid not to play the match, for reasons ranging from financial strain to not being consulted. Since joining the ‘Green Army’ midfielder Rama Salim and striker Dan Sserenkuma have been at the epicentre of Gor Mahia’s resurgence under Croat head coach Zdravko Logarusic. The pair has been instrumental in K’Ogalo’s seven consecutive winning run in the Kenyan Premier League (KPL), exciting the Gor support to a level that has seen them acclaimed from the stands to social networking sites. Salim, a former Congo United player who was recruited from the coast-based side in January after relegation from the top flight is delighted he found a haven in K’Ogalo. “My move to Gor which is a bigger club that Congo was a huge challenge and I had to put in a lot of hard work which I’m glad it’s paying off,” the KPL Young Player of the Year award winner told Capital Sport after a training session at the City Stadium. He sank in a brilliant hat trick in their 3-1 victory over KCB a fortnight ago and was in the score sheet last weekend during the 4-0 drubbing of City Stars, Gor’s biggest win this season. In the two ties, their partnership with Sserenkuma was the catalyst as they ran rings around the defence in their quest for goals which were reflected at the end of the final whistle. Ugandan international Sserenkuma, City Stars top scorer before switching sides during the June transfer window, returned to haunt his former employers by scoring a brace on Saturday and strongly believes he will flourish during his stay at Gor. “It’s a pleasure working with Rama and the other players, this is a club I love and I feel close to the fans,” the soft spoken goal poacher added. He however admitted the tie where he was named a man of the match gave him mixed feelings. “It was good game for me since I always want to score in every game but I felt sorry for my former team but it’s my job to score and that had to be done,” he detailed. The two said they owed their recent good form to the belief that Logarusic has in them as he understands their strengths and has always urged them on as the side continues its charge to the summit of the league. “Coach (Logarusic) is one the best in the country; he has impacted a lot of skills in me and taught me many things I didn’t know when I was in City. “He is always behind me with lots of support and am hoping I will keep doing my best,” Sserenkuma told. “At first we thought he was applying so much pressure on us but we got used to his style and now understand he is not that hard since it’s all about results in the end. “I have noticed that he doesn’t say ‘you have done well’, but prefers to use the words ‘you have not done your best’ which gives you the urge to improve in each game,” revealed Salim. The two penned two year deals at the club, but unlike Sserenkuma who is keen to stay, Salim is not resting on his laurels as he harbours ambition to further his career outside the KPL. “I consider this is a stepping stone, besides I have the support from the technical bench who have told me repeatedly that should I get a chance for trials particularly abroad I will have their full backing,” the midfielder asserted. “This was a good move for me and I feel at home, I wish I could sign for ten years but that is up to the technical bench for now,” Sserenkuma said on his part. The two are expected to be key figures during the Top 8 derby against rivals AFC Leopards on Sunday which they consider a victory will be a befitting gift for their loyal fans. “It will be a tough game but the players are ready to give their best for the fans,” they concurred. AFC Leopards has come out to clearly explain reasons why they decided to announce that they will not honour this weekend’s KPL Top 8 fixture against Gor Mahia claiming KPL and the league organizers did not consult them before fixing the date for the match. This comes just hours after KPL held a pre match stakeholders meeting at Kasarani on Wednesday where AFC Leopards was not represented. “It would have been prudent for KPL to consult the club on its position to honour the match and furnish the club with other important details such as the rules of this tournament and all other pertinent information to enable the clubs EC to make an informed decision. The consultation we believe is one that can take place in one day at a round table featuring our opponents Gor, KPL and ourselves. Surely that is not much to ask for. It is quite simple: We want to play Gor Mahia FC at a convenient date and not hurried circumstances that arouse suspicion.” The statement continues to say. AFC Leopards officials did not attend the pre match meeting held at Kasarani on Wednesday and when asked whether AFC had received communication on the match and the said meeting, KPL CEO Jack Oguda said the same AFC Leopards had written a letter a week ago requesting for advance payment ahead of the match. “Last evening (Tuesday) we received a letter from AFC Leopards informing us that they will not honor the match because they were not aware about the change of dates. But a week earlier they had also written to us requesting to know about advance payment ahead of the tournament and for them to say they did not know anything about the match is a contradiction.The game is beautiful and should remain beautiful so AFC should honour the match and avoid bringing the game into disrepute.” Oguda said on Wednesday. The CEO went ahead to explain that according to rules and regulations set up by all clubs including AFC, the tournament is meant to enhance competition besides the main league. He said KPL funds all Nairobi clubs with 100,000 shillings to facilitate logistics while they facilitate transport (air) and accommodation for all teams from outside Nairobi as well as pay allowances for all players and officials of participating teams. But AFC in the statement continued to say that, “We as a club have the greatest respect for KPL. In fact, our Chairman is a Director of the Kenyan Premier League Limited. We do not value money and have always taken part in tournaments to play for our pride. Whatever cash incentives may come out of the participation is a mere bonus to us. That is why we have been playing in the FKF Cup or Presidents Cup even when we know we may be spending money that we don’t get back.” The statement read in part. AFC Leopards SC will not honor their rescheduled Kenyan Premier League (KPL) Top Eight Cup fixture against Gor Mahia FC, on Sunday 29 July, at Moi International Sports Centre, Kasarani. In an exclusive interview with futaa.com, Secretary General Winston Kituyi said that even after rescinding their earlier decision not to honor the match, the organizers (KPL) did not consult them over the fixture’s date. -As it stands now, the truth of the matter it that we are not there and we will not honor that match on Sunday. Our concern was that, since this match was postponed, it was our desire that KPL would have called both teams (AFC-Gor) on a round table to discuss and come-up with appropriate date that suits both of us, he said. -But unfortunately nobody bothered about it, they just came up and said okay, since Tusker are going to play CECAFA we can reschedule the fixtures and in-between you can put the Super Eight match. -I consulted with my people and they are not happy and the even the chairman who gave an okay that we should play, should have been consulted and at least agree on the date. They don’t just come and say, this is the date and therefore we play. -You know very well AFC is experiencing a lot of problems, at the moment we don’t have money; somebody filed a case in the court and we can’t access the bank account. We are operating from our own pockets and that is why we need time to prepare the team. -We presented our budget to KPL and told them, if they wanted us to play they have to tell us in good time and explain to us how we are going to meet the costs of this arrangement, something that’s not forthcoming. -We would like them to call us together with Gor, sit down and agree on the date; most likely at the end of the season. We can still honor this match. Remember this is not a friendly match, it is a serious match that if you lose it is over and if you win you will go places. So, we take this match very seriously. -Also putting in consideration the history of these two clubs on what happens whenever we play.We don’t want to disrupt the psychological impact of both teams, just because something ugly is going to happen. -As far as we (AFC) are concerned, we are not there. We have discussed widely and I have written a letter to KPL about the same. I am waiting for their feedback. Everybody is busy preparing for the league and we would like our players and coaches not to have excuses, that’s if only both of us (AFC-Gor) will be invited on a round table and agree on suitable date, insisted Kituyi. Gor Mahia coach Zdravko Logarusic is keeping the hope that the highly rated Ugandan midfielder Eddie Mubiru who was signed by the club in the June transfer window will be available for selection soon. Mubiru was captured from Ugandan side Kampala City Council (KCC) but the two sides are yet to agree on the youngster’s transfer fee which is unofficially placed at Kshs 1.2 – 1.5 million though the coach believes an agreement will be reached soon. The Croatian tactician admitted he is looking forward to having the player in his team and revealed that a representative from the club will soon be going to Uganda for a face to face discussion with the club. -Mubiru’s issue is not yet cleared; his former club’s asking price is a bit too high for a player coming straight from high school but I should admit the boy is very talented and has a great future ahead of him. -The club’s officials have been speaking with his former club on phone but a meeting has been organised so I think someone will be travelling there soon to try and strike a deal. I hope an agreement is reached soon because I want to have him in my team, he told futaa.com. The player’s feelings after the move were clear for all to see after he admitted his joy at joining the Kenyan Premier League (KPL) giants earlier on. A brace from Danni Sserenkuma and one goal each from Rama Salim and Edwin Lavatsa extended Gor Mahia’s unbeaten form to eight matches in a row and cemented their position in the Kenyan Premier League top six. The one sided encounter was played at a packed City Stadium on Saturday afternoon. 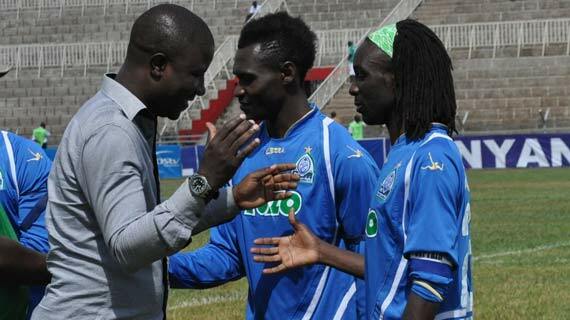 Gor Mahia showed intent to score from the time kick-off whistle was blown. Danni Sserenkuma won a free kick in a promising position but Victor Ali wasted it. A minute later on the other end, a casual mistake by Donald Mosoti allowed experienced Francis Thairu space to shoot but the hawk eyed Fred Onyango parried the shot for a corner. The corner went inside the net but the referee came to Gor Mahia rescue when he ruled that Ibrahim Kitawi had pushed keeper Onyango from behind. Gor Mahia continued with their attacks. In the 15th minute Donald Mosoti’s header from a free kick well was dealt with well by former K’Ogalo keeper Roy Kagunzi who was between the posts for the Kawangware side. Red hot Danni Sserenkuma opened the scoring in the 18th minute with a beautiful shot that City Stars defender Nicholas Ochieng had a slight touch of. Kevin Omondi provided Sserenkuma with the pass. Nine minutes later Sserenkuma again beat his marker again then placed his shot past the keeper for his brace that doubled Gor Mahia’s advantage. In the 33rd minute City Star’s Francis Thairu stole the ball in midfield then set-up Justus Basweti who fired off target. The other close chance fell to Gor Mahia through Victor Ali who rifled a shot from distance but despite City Stars keeper spilling the ball, no Gor striker was in place thus allowing the defenders time to clear the threat. Gor Mahia led 2-0 at half time.. Ten minutes after the break, an advancing Danni Ssereknkuma missed a clear opportunity after Rama Salim did well to beat two City Stars defender then send a cross. A minute past the one hour mark substitute City Star’s George Mwangi who had come on for Francis Thairu wasted a great chance with only the keeper to beat. Rama Salim made it 3-0 in the 63rd minute with a solo effort. He rounded the keeper then calmly slotted the ball into the empty net. Satisfied with the result, Gor Mahia coach Logarusic brought in Edwin Lavatsa and Itubu Imbem for the goal scorers Rama Salim and Dann Sserenkuma. The pair had an immediate impact but Itumbu Imbem’s goal after a great effort from Lavatsa was ruled offside. Edwin Lavatsa showed some class with a great move and goal two minutes to the end of regulation time to compound city Stars misery. City Stars: Ronny Kagunzi, Mark Ongwae (Peter Ashango), John Amboko, Nicholas Ochieng,Arthur Museve , Boniface Onyango, Dennis OKumu, Justus Basweti, Ibrahim Kitawi (David Kingatua 67), Francis Thairu (George Mwangi) , Duncan Owiti. Unused Subs:Fredrick Majani, Simon Ogutu,Alex Achoki, Joel Shebuliba. Kenyan Premier League (KPL) giants Gor Mahia beat the Kenya U20 national side 1 – 0 in their friendly match played on Thursday 19 July at the Nairobi City Stadium. Edwin Lavatsa scored the only goal in the 64th minute after a nice build up by his team mates from the midfield which left him on a one on one with the national side’s goalkeeper Joel Bataro and he looped the ball over him. Despite the defeat, the national side will take the plaudits for direct play against Gor Mahia as they managed to create good chances and attempts on target while Bataro was outstanding in goal managing to stop the hardworking forward duo of Itubu Imbem and George Midenyo.